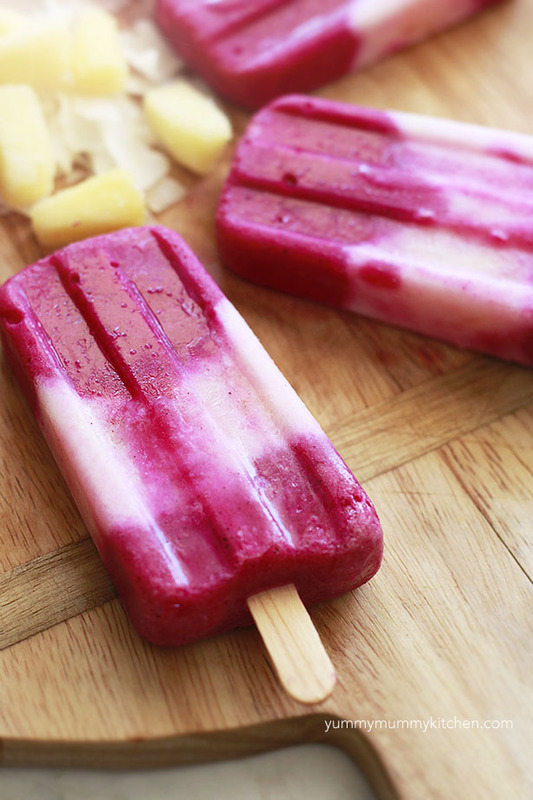 Pitaya blended with coconut milk and pineapple to create a tropical nutritious popsicle recipe for breakfast or dessert. //embedr.flickr.com/assets/client-code.js My girls and I love acai and pitaya smoothie bowls for breakfast on warm summer mornings. If you follow me on Instagram you know what I mean. I blend frozen pitaya packs with other fresh or frozen fruit, a little almond milk or coconut water, and top with chia seeds, granola, and fresh fruit. Pitaya bowls are not only bursting with nutrients, they are beautiful little works of art. 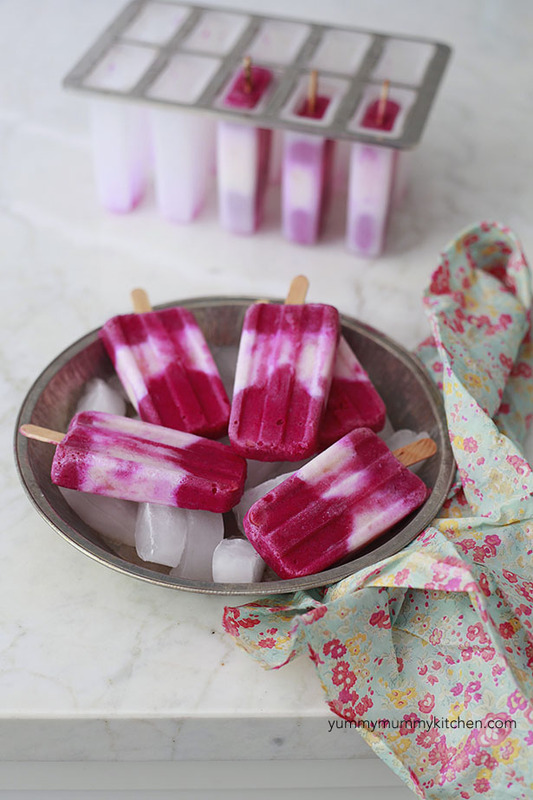 This week we decided to have a little fun and make ice pops instead of bowls. If you are unable to find pitaya packs you could use frozen acai packs, 1 fresh dragon fruit, or a handful of berries. Pitaya smoothie packs can be found at most natural grocery stores. There’s a store locator here for Pitaya Plus. PS this post is not sponsored, I just love the product. Every time I use pitaya packs I exclaim the same thing: “I can’t believe this color! Nature is so amazing!” I’m sure my kids are getting tired of hearing this, but really, the fuchsia ice creamy mixture in my blender is incredible. The center layer of this tastes like a pina colada. After trying many ice pop molds, this one is my favorite. I love the old fashioned look and the wooden sticks. I bought a box of hundreds of sticks at Michael’s. Disclaimer: when you shop Amazon through my links I earn a very small commission, which helps to cover the costs of running this blog, so thank you! In a blender or food processor puree 1/2 cup coconut milk, pitaya broken up into pieces, 1/2 cup of the pineapple, mango, and banana. Add a little water if needed to turn the blender. Spoon pitaya mixture about 1/3 the way up the popsicle molds. Insert the sticks and freeze. Transfer the rest of the pitaya mixture to a bowl and place in the refrigerator. Wash out the blender. In the clean blender, blend the rest of the coconut milk, 1/2 cup pineapple, and 1/4 cup honey. Once the first layer of the pitaya mixture has frozen enough to hold the popsicle sticks up, pour the coconut pineapple mixture another third the way up the popsicle molds. Place back into the freezer until this layer has frozen. Finally, spoon the last pitaya layer into the molds. Freeze completely. To remove the popsicles, run the mold under hot water for a few seconds.